Mr. John Moss had two shops, for his pawnbroking and tailoring business, started in the late fifties. This was 52 South Street (East Side) in 1871. Born in June 1824 John Moss was the oldest son of labourer Joseph and Mary (nee Lowe). He had one son and two daughters by his first wife. John had married Emma Noon, daughter of Samuel and Mary (nee Hardy) in September 1845. They had at least six children together before Emma died aged 36, in February 1859, from chronic bronchitis, a few days after the premature birth of son Edwin Noon Moss. 1. John married Miss Lizzie Barker of Burr Lane. He had a tailor and outfitting business in Bath Street. In March 1868 their oldest son, John Lowe Moss, married Elizabeth, daughter of James Alexander Barker, butcher of North Street, and Matilda (nee Ball), and for a time John assisted in his father’s business. Then for a few years from the early 1870’s he traded as a clothier in Market Street, Eastwood, before returning to his Bath Street branch in 1881. He continued trading as a clothier and outfitter at 44 Bath Street and died there in December 1908, aged 62. 2. Albert left the area as a young man, married in London in 1876 and then went north to the Birmingham and Dewsbury areas (and Lancashire) working as a pharmaceutical chemist. 3. Emma, eldest daughter married Mr. Henry Thompson, draper, Bath St., now H. Carrier & Sons’ offices. Emma married Henry Thompson, draper and hosier of Bath Street in December 1878. Henry was born in Radford, Nottingham in 1850, the son of miller Thomas and Patience (nee Bates). By 1878 he had worked as an assistant at the Bath Street shop of draper Joseph Carrier for 14 years and in the month before his marriage had branched out on his own. He opened his draper’s shop at 108 Bath Street, next door to Richard Riley, at premises recently occupied by watchmaker Henry Hoggarth Beaumont. Henry Hoggarth had established himself in Ilkeston in 1867 as a jeweller and dealer in musical instruments and in 1878 moved into the premises previously occupied by clothier John Stinson – at 95 Bath Street, opposite the Primitive Methodist Chapel. 4. Pollie married Mr. Burrows, a schoolmaster. In May 1879 daughter Mary Ann alias Pollie married Beeston-born National School master William Ralph Burrows and moved to Monmouthshire. 5. Son Edwin Noon died aged three weeks and an unnamed daughter died after one hour. Three months after his wife Emma’s death John senior married his second wife and Emma’s half-sister, Mary Scattergood, daughter of John, boot and shoemaker of South Street, and Mary (nee Hardy, formerly Noon). This union resulted in nine more children for John Moss although not all of them survived infancy. In March 1863 two men entered John’s shop and attempted to pawn a silver cream-mug and a silver-plated mustard-pot. The broker was suspicious. He placed the articles in his desk and was about to detain the visitors when they scarpered, nicking a cloth cape and a coat as they left. Persistent John cried ‘stop thief!’ and then endeavoured to follow his own instructions. He chased the pair unsuccessfully for three miles and as a consequence suffered severely for the following three weeks. Later the silver items were handed over to the police together with a description of the two men and further information which soon led to the arrest and conviction of a brace of Belper brigands. The stolen property belonged to Joseph Palmer, currier of Bridge Street in Belper, who had offered a £5 reward for information leading to the conviction of the thieves and who now promised that sum to John. The Belper New Association for the Prosecution of Felons offered an additional reward of £10 as part of its policy to pursue villains. The situation however was complicated by the fact that several other witnesses had given information to the police and it had to be decided who was entitled to how much of the rewards. Thus John waited for his share …and waited…and waited…. Two years elapsed and the pawnbroker’s patience was exhausted such that he sued Joseph Palmer through Belper County Court for ‘the recovery of the reward’. The judge pondered long and hard on the case and his deferred decision was that, because of the significance of John’s evidence, especially in apprehending and convicting one of the thieves, he was entitled to the whole reward. A month later and John was back at the same court, now suing for the recovery of the reward offered by the Belper New Association. The same arguments were heard and the same judge gave the same verdict. He was surprised that the Association had even brought the matter to court and had not yet paid out the reward. It would have been more to its credit had its members had said to John ‘You have given the information and we are very willing to pay you the reward’. John left the court £10 richer. Coincidentally at the first Belper hearing — when John was the plaintiff — his son John Lowe Moss appeared as a defendant in a separate case when he and printer William Brentnall Wheatley were charged by Bath Street tallow chandler Moses Mason with causing damage to a trap owned by the latter. Moses had a licence to let out horses and traps and in October 1864 had hired out both to John and William. When they returned the trap, the shaft and splashboard were broken and wheelwright Joseph Scattergood had to be hired to effect the repairs. Moses was now claiming for the damages. There was a defence however. The hiring was illegal as it had taken place on Sunday and John was not yet 21 – he was 18 — under age to hire the vehicle. He thus made a plea of infancy but the judge was having none of this. There was joint possession of the trap, both John and William were under an obligation to return it as they got it and so both were responsible for the damage. “A plea of infancy to break a trap to pieces, or a man’s head, or anything of that sort, was no defence”. Both defendants were ordered to pay. John’s persistence was also demonstrated in 1877 when again he was ‘galloping’ down South Street towards the old toll-bar, again crying “stop thief!” in pursuit of a skirt, attached to which was Myra Copen, but which minutes earlier had been hanging on a rail inside his shop. He apprehended Myra and handed her over to the police despite her pleading for forgiveness and to be allowed to pay for the skirt. Sentenced to the House of Correction for a month. 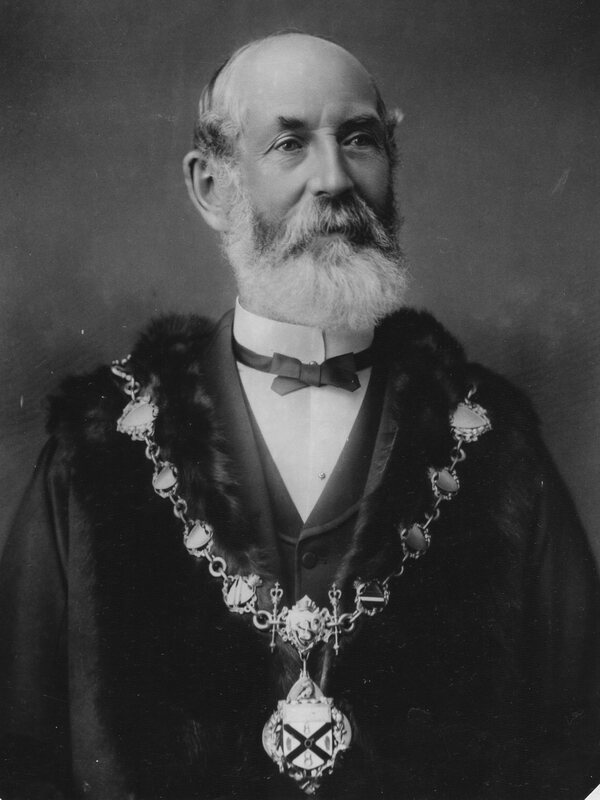 During his life John senior was a member of the Local Board, the School Board, a National School manager, Overseer of the poor, an Oddfellow and Freemason, a Churchwarden, member of the Town Council, then Alderman, and in 1891 he was chosen as the fourth Mayor of the Borough. In the summer of 1890 the Moss family received a visit from Mary Moss’s sister Sarah (nee Scattergood) – John’s sister-in-law. The latter had married Nottingham baker and confectioner William Gadsby on New Year’s Day in 1868 after which and for a short time they had gone to live in Nottingham. In the early 1870’s the family left to live at Fall River, Massachusetts and it was from there that Sarah was making her visit. Sadly during her visit she died at the Moss family home in South Street and is buried in St. Mary’s Churchyard with John’s first wife Emma and his sister Hannah. Of the children of John and Mary…. 1. Louisa was born in 1863 and married commercial clerk Arthur Herbert Barber in November 1884. He was the elder son of Stanton by Dale lacemaker David and Mary (nee Plumb) and was employed as a clerk at Stanton Iron works. The couple then lived at Lillock Road in Stanton by Dale. Suffering from extreme nervous depression in 1915, Louisa’s body was recovered from the Erewash Canal, the assumption being that she had committed suicide. Her family home was then at ‘Braeside’ on Longfield Lane. 2. In December 1882 Lucy married tailor, clothier and outfitter Josiah Sutton, born in Leicester, the son of timber merchant Robert and Catherine (nee Haddon). They lived for a few years at Clay Cross where Josiah had a shop before returning to Bath Street about 1887. He traded at 59 Bath Street and that is where he died in February 1917, aged 60. 3. Money lender Horace was educated at St. Mary’s School, Ilkeston, under headmaster William Frost and then at the Collegiate School, Morley. In September 1890 he married Maria Dickenson Wood, daughter of North Street baker Samuel and Susannah (nee Straw). For several years their family home was at Cotswold House in Lord Haddon Road. 4. Ellen the second lived, unmarried, with her parents. She died in 1933. 5. For her first husband Elizabeth married grocer’s assistant John William Winrow in December 1898. Born in Dale Abbey he was the son of grocer Stephen, who traded in Town Street, Sandiacre before his death in 1886, and Hannah Mary (nee Salt). John William also died in Town Street in May 1911 and eight months later his widow Elizabeth married auctioneer and widower William Briggs junior, son of Ilkeston watchmaker and jeweller William senior and Mary (nee Barlow). 6. In 1913 accountant and money lender Frederick married Hilda Maud Humphrys, daughter of Ilkeston Gas Works manager Frederick Chilton and Rebecca Florence (nee Porter) of Charnwood House in St. Mary Street. 7. Three other children died at birth (an unnamed daughter) or very young (Joseph and Ellen the first). “After an illness of four or five months’ duration, caused by an attack of paralysis” John died at his South Street home on Saturday, May 26th 1894. He was buried at Park Cemetery on the following Wednesday after a service at the Parish Church which was accompanied by vivid lightning and reverberating thunder. The Advertiser noted that “a force of constabulary, under Inspector Savoury, preserved order at the church gates, and elsewhere where the crowding may have caused inconvenience”. John’s second wife Mary died at 29 Gregory Street on January 9th 1926. We now have to cross Gladstone Street.